Today we released the latest Apache Camel 2.22.0 release which is the first release to officially fully support Spring Boot 2. This is a major effort as the Spring Boot v1 to v2 upgrade for a big framework like Apache Camel took some effort - so many thanks to the Camel team and the contributions. The support for Spring Boot 2 was the major goal of this release and therefore this release comes as soon as possible after the previous Camel 2.21 release, and as such, this release does not contain as much else as a normal release happens to include. 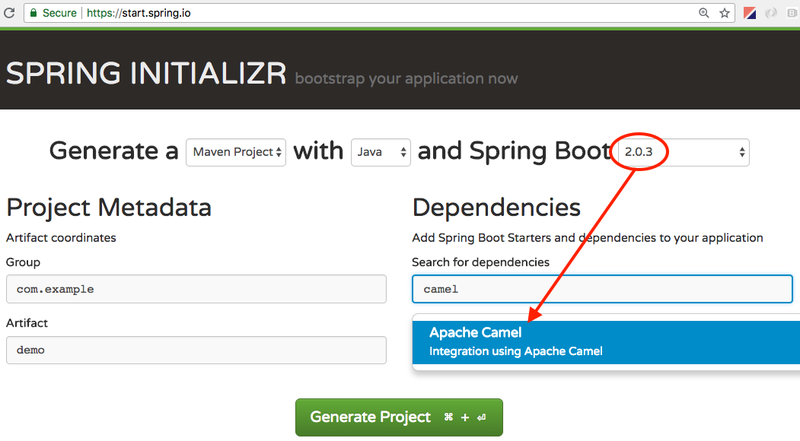 The Spring team has already updated their start.spring.io website to now include Apache Camel when you use Spring Boot 2. 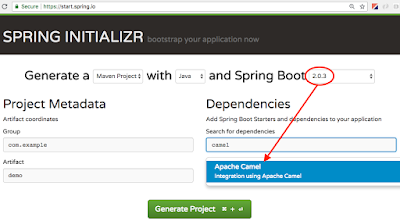 If you are using Spring Boot 1, then the previous versions of Apache Camel, such as 2.21.1 works with SB1. The release also includes some other noteworthy improvements such as an internal optimisation to the toD EIP with HTTP endpoints to better reuse existing http connections when sending to the same host with all sort of dynamic parameters. The Rest DSL has also been improved to support specifying security definitions that will be included in swagger doc. We also added support for enabling client request validation so the Rest DSL can validate whether a request can be processed based on its content-type and accepted response-type, and whether all mandatory parameters is included, and so on. camel-as2 - Component used for transferring data secure and reliable over the internet using the AS2 protocol. camel-google-mail-stream - The google-mail component provides access to Google Mail. camel-micrometer - To collect various metrics directly from Camel routes using the Micrometer library. camel-mybatis-bean - Performs a query, insert, update or delete in a relational database using MyBatis. camel-service - Represents an endpoint which only becomes active when the CamelClusterView has the leadership. camel-web3j - The web3j component uses the Web3j client API and allows you to add/read nodes to/from a web3j compliant content repositories. The next bigger Camel release is expected to be Camel 2.23 where we also would work on getting more of the documentation migrated to the new system, and with some luck have a new website and documentation ready for this release. Also we will start to discuss the roadmap and bigger goal of Apache Camel 3 in the community. When this happens then we will post more about this in our blogs and elsewhere, so keep an eye if you are interested to help and provide your thoughts on this matter. Now go and enjoy the Camel on Spring Boot 2.